Royal Mail deliver your seeds and other items to your home or business address. Seeds arrive in bubble envelopes and most orders are delivered through a normal letter box. Royal Mail also deliver your parcel. You may be asked to sign for a larger parcel. We dispatch orders within 1-2 working days of payment. Most orders completed before 12 noon on a weekday are sent out the same day. Wedding & Party Favours are sent out two working days after we have agreed the customised seed packet with you. Let us know if you have any special requests for delivery. Seeds are packed in bubble envelopes and you choose standard second class delivery or faster, first class delivery. Prices shown in the table below. 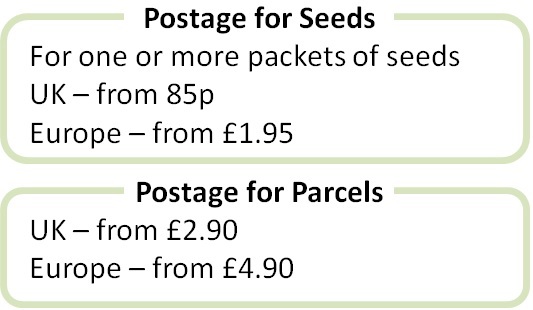 There is one standard charge for 1 or more packets of seeds. Bulbs and larger items arrive in small to larger boxes depending on the size of the bulbs and the number you have ordered. The cost of postage is shown for each item. Most bulbs cost £2.95 to send within the UK and £4.95 within Western Europe. Smaller bulbs attract the same delivery charge as seeds. Seeds are shipped free of charge where they are added to a bulb order. We deliver items for free in the Roseland Peninsula in Cornwall, where our business is based. You can choose this option for delivery to any address beginning with postcode TR2 5.